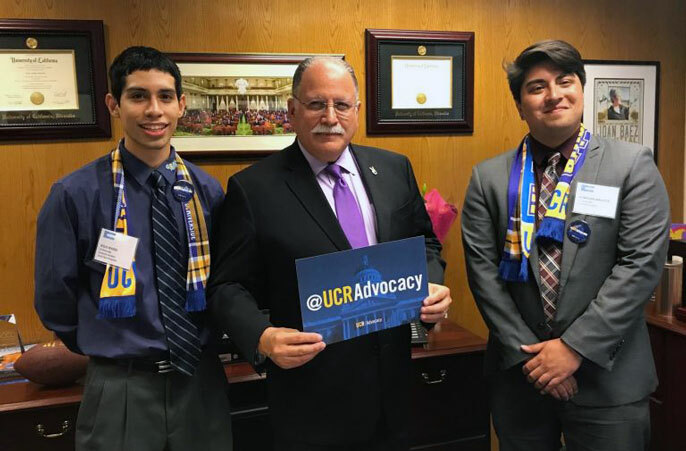 UC Riverside graduate students Jesus Rivera (left) and Donovan Argueta with Assemblymember Jose Medina, D-Riverside. Argueta’s research focuses on the molecular mechanisms that drive the onset and persistence of obesity and the impact of diet. He is studying the endocannabinoid signaling system, which is a potential target for therapies and prevention in obesity. UC Riverside’s Jesus Rivera (left) and Donovan Argueta with UC President Janet Napolitano. Argueta grew up in Palmdale. He received his bachelor of science in bioengineering at the California Lutheran University in Thousand Oaks. Jesus Rivera is a graduate student in materials science and engineering. His advisor is David Kisailus, the Winston Chung Endowed Chair of Energy Innovation and a professor in the Department of Chemical and Environmental Engineering and Materials Science and Engineering program. Rivera shared with legislators his research on creating the next generation of lightweight, impact resistant materials for use in aerospace and automotive applications by looking to nature for inspiration. Specifically, Rivera is studying a beetle that can survive being run over by a car to create next-generation helmets, protective vests and structural materials for electric automobiles and aircraft. “Graduate research remains a vital part to the UC system and it is important that legislators know of the great work that is being done at these universities and the benefits it provides to students and community,” Rivera said. Rivera grew up in Pico Rivera in Los Angeles and earned his bachelor of science in mechanical engineering at UC Riverside.